Sold with copy of a letter from the Reserve Bank Governor dated 21 October 1983. Ex Roxbury Sale May 1992 (lot 1190) and Monetarium list, March 2005. On 21 September 1982 several men hid themselves in wooden boxes in the same aircraft and in the same hold as consignments of Australian notes, with the intention of stealing the money during the flight. An employee of TAA noticed the movement of a person inside a box on board an aircraft which has just landed at Rockhampton, Queensland, and alerted others. He then chased and apprehended the man. Other TAA employees realised that this may not have been an isolated incident and their prompt actions led to accomplices being arrested in Townsville, Mt Isa and Brisbane. On 21 October 1983, the Governor of the Reserve Bank of Australia, Mr R.A.Johnston presented awards to ten TAA employees. The main cash award was made to the employee from Rockhampton. Each man received a set of Orrefors glassware and a personally inscribed volume of specimen Australian notes. The volumes were a modified version of those which contained Type I specimen notes in 1966. The books presented to the TAA employees contained one specimen note of each denomination $1.00 to $50.00 bearing the signature combination of Johnston/Stone, with Type 3 specimen overprinting. All the notes from $1.00 to $50.00 have OCR-B serial numbering. This is of particular significance because the OCR-B serial numbering was not used on circulated $1.00 notes at all, or on $50.00 notes of that signature combination. 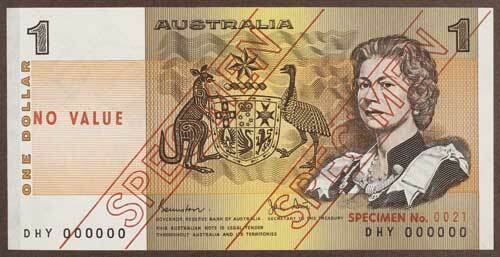 (Courtesy of Michael P.Vort-Ronald, Australian Decimal Banknotes, 1985).